• Sensitive and accurate. Use as little as 5 μL samples. Detection range 0.01 - 5 g/dL (1.5 - 750 μM) albumin in 96-well plate assay. • Albumin is the most abundant plasma protein in human. It accounts for about 60% of the total serum protein. Albumin plays important physiological roles, including maintenance of colloid osmotic pressure, binding of key substances such as long-chain fatty acids, bile acids, bilirubin, haematin, calcium and magnesium. It has anti-oxidant and anticoagulant effects, and also acts as a carrier for nutritional factors and drugs, as an effective plasma pH buffer. Serum albumin is a reliable prognostic indicator for morbidity and mortality, liver disease, nephritic syndrome, malnutrition and protein-losing enteropathies. High levels are associated with dehydration. Simple, direct and automation-ready procedures for measuring albumin concentration in biological samples are becoming popular in Research and Drug Discovery. BioAssay Systems BCG albumin assay kit is designed to measure albumin directly in biological samples without any pretreatment. The improved method utilizes bromcresol green that forms a colored complex specifically with albumin. The intensity of the color, measured at 620nm, is directly proportional to the albumin concentration in the sample. The optimized formulation substantially reduces interference by substances in the raw samples. The two kits use different albumin specific dyes and hence the major difference lies in the sensitivity and wavelengths. Both assays have advantages and disadvantages. DIAG-250 (QuantiChrom BCG Albumin Assay Kit) uses bromcresol green, a dye that is more (about 2-fold) sensitive than bromcresol purple used in the BCP albumin assay. BCG is not absolutely specific for albumin, however, it also reacts with ?1- and ?2-globulins, and adds a positive bias. 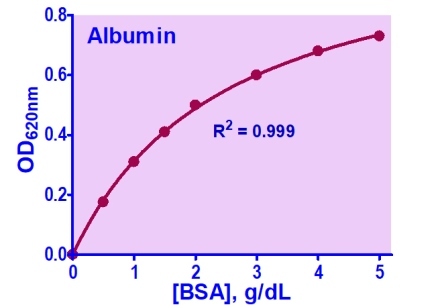 The BCP method, although more specific, underestimates albumin in certain samples, e.g. from patients undergoing hemodialysis. If your samples are sera or plasma, which have high albumin concentrations, I would suggest using the DIAP-250 assay kit (detection wavelength 610 nm). If the albumin concentration is low, DIAG-250 is the best choice (detection wavelength 620 nm).